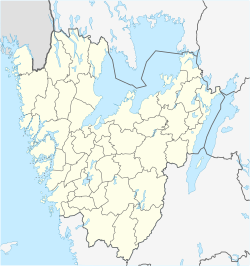 Mariestad ( pronunciation) is a locality and the seat of Mariestad Municipality, Västra Götaland County, Sweden. It had 15,591 inhabitants in 2010. It was until 1997 the capital of the former Skaraborg County and an episcopal see in the Church of Sweden between 1583 and 1646. Mariestad circa 1700, in Suecia antiqua et hodierna. The city was founded in 1583 by Duke Charles, who later became King Charles IX of Sweden. The city is named after his wife Marie of Pfalz. The coat of arms for Mariestad, an ox stepping out of the water, is said to be what Marie of Pfalz saw by the bay of Tidan in Mariestad when she first arrived there. Mariestad is one of two Swedish cities with a cathedral without a bishop's seat, the other being Kalmar. For political reasons, the diocese of Mariestad was presided over by a superintendent rather than a bishop from 1583 until 1646, when the superintendent was moved to Karlstad and the diocese of Mariestad was absorbed by that of Skara. Dag Wennlund (1963-), Retired javelin thrower. Wikimedia Commons has media related to Mariestad. Wikivoyage has a travel guide for Mariestad. This page was last edited on 14 April 2019, at 00:57 (UTC).